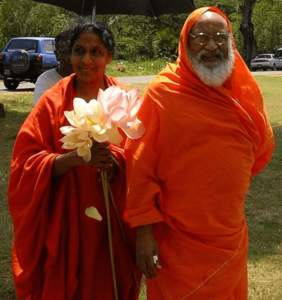 Pujya Swami Dayananda Sarasvati- His Holiness in the ancient tradition of India-Veda Vyasa Traditon , Guru/Teacher to Maya Tiwari, whom was also initated into the Veda Vyasa Tradition, a lineage which has been handed down from the celestial sphere of Dakshinamurti (Lord Shiva dissiminating Self-Knowledge). The first Guru is the lord, the creator. We trace the parampara, lineage, back to the Rishis -the students of Lord Siva as Dakshinamurti. The Rishis revealed the knowledge of the whole which is unconstrained by time, space, and matter. This study of Advaita Vedanta (non-dualism) was fortified into a precise methodology by Sage Adi Sankara around 500 BC. The Wise Earth School and its Inner Healing methodology follows in the illustrious footsteps of the Rishis, reintroducing authentic Ayurveda in accord with the Greater Vedas.